Tomorrow, Rancho Vista Golf Club is partnering with Palmdale Sheriff Station to host it's first annual toy drive on 12-18-18! 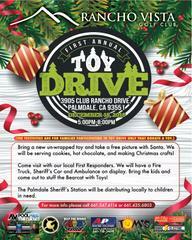 Families are invited to donate new/unwrapped toys to be distributed to local children during Palmdale Station's annual toy give away. Come out and take pictures with Santa and help us stuff the Bearcat full of toys! See the flyer for additional information. Hope to see you there!